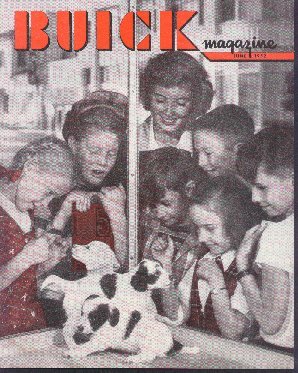 " Buick Magazine - June 1952." (1194) Buick Magazine - June 1952 - Condition: Very Good Very interesting magazine published by the Buick Company, and put out by Whitaker & Son, a Buick Dealorship which is still in Sidney, NY. The magazine contains several articles including: The Valley Beautiful, Prairie Trek, Acadia, Buicks XP-3300 Dream Car, Museum with a Sparkle, and Take a Timber Tour. Each article is full of wonderful photos both tinted and B&W. There is a full page ad showing the Buick Roadmaster. The magazine measures 8 1/4" by 10 1/4" and has 15 pages. Price: $7.00 + Shipping.